Super Big Size Eraser "Radar S-10000"
Super Big Size Eraser ''Radar S-10000'' by Seed at Stickman's Blog. MPN: S-10000. Hurry! Limited time offer. Offer valid only while supplies last. Monument of the eraser world ? There are many strange eraser. Like real teeth, puzzle, shine in the dark etc. But this ''Radar S-10000'' is special. Monument of the eraser world ? Ah... this is the Everest Mt. in the eraser world. 10.8 × 5.5× 1.6 (inch) and 80.5 (oz) ... 80.5oz ! How difficult you handle... please aim at the letter ! Oh, You can use this as objects etc. All depend on your imagination ! Ah, but the main use is e "to erase". So, please put in pen case or on the table always. Because performance is very high grade ! 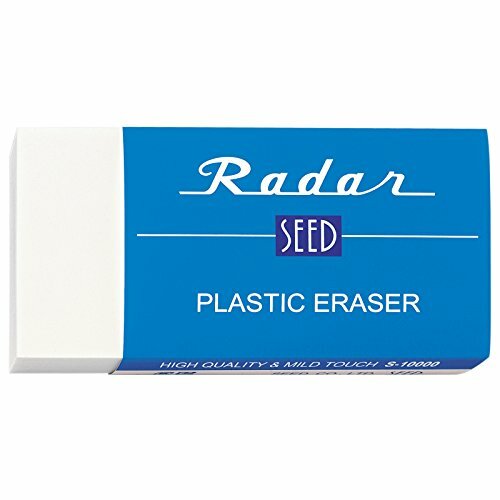 First plastic eraser - "Radar"
"Radar" is the flag ship series of SEED. It means also in the eraser world. Plastic eraser - this is the pioneer of the new eraser generation. Actually, "Radar" is the first manufactured plastic eraser in the world. From then , "Radar" has become standard. That is to say, this "S-10000" size will be standard size in the distant future. Perhaps. can't find the words, and no need. But this is "Radar". Performance is certain.